This is a huge article and I may turn it into a little book some day. “Too Many Visas and Green Cards for Tough Economic Times,” and “Americans Should Get Jobs First,” are two articles that are featured separately on this Web site, and are included in this details package on the impact of legal immigration on American Jobs Simply for your convenience. Following the second article, you will find a great deal of retails on this issue. Don’t get too tired reading now, OK? During a debilitating recession, why would a government of the people, with almost 20% unemployed citizens, grant over two million work permits to foreign nationals each year? In three years, the White House can credit without dispute something less than 800,000 new jobs. During the same period over three million new foreign workers got jobs in the US. If they were not employed, they would be deported. Additionally, over three million foreigners here on temporary visas got those visas made permanent. Can the US economy right now afford such benevolence to foreign workers at a time when Americans are without jobs? What if we just did not give the two million foreigners each year the jobs that were once held by Americans? That could not help but improve our employment picture. However, the employees of this government do not know they work for the people. They work for the politicians whose only goal is reelection. By their indifference to we the people, every day the government tells us exactly where to go for redress. Unfortunately Satan is not holding any temporary hearings. It is that simple. And, the atheists are not talking. It is not my intent to show any disdain for government employees per se. We just have too many of them. Soon, I fear they will outnumber us. Moreover, it is a fact they are often unmotivated and often have delusions of grandeur about the positions they hold for which we pay them a salary often better than our own. Andrew Jackson was very concerned about paid government employees when he wrote: “No man has any more intrinsic right to official station than another. Those who hold government jobs for a long time are apt to acquire a habit of looking with indifference upon the public interests, and of tolerating conduct from which an unpracticed man would revolt.” When we look for answers in government, the point is we don’t see the face of Obama, we see Obama’s decisions in the face of the government employee. We are only discussing new legal aliens in this short thesis. Of course it is not appropriate in decent circles to suggest that of the 20 million illegal foreign nationals, some of them might be taking American jobs. Yet, I saw a statistic yesterday on mainstream TV that said that if there were just 20 million illegals, and we sent them all home over an appropriate amount of time, over seven million Americans would be re-employed. I would like to suggest there are really 50 million illegal aliens in this country right now, and I would like anybody to prove me wrong. They can't! How many jobs is that? Our monstrous national government is so big that it sues whole states in court to show its power. How much standing do you think an individual American needing a job has today with this behemoth government when it is so big that it has no fear of taking whole states to court? My bet is a four letter word N-O-N-E! The US Government in Washington is not kind and docile. It is reckless and demanding and most interested in growing itself out of control. It reminds me of that red squishy thing in the movie, “The Blob!” Like it says in the theme from “The Blob:” the central government “creeps, and leaps, and glides and slides.” It grows by leaps and glides and slides into every facet of our lives from light bulbs to one ply toilet paper to the amount of sugar in soft drinks to choosing not to enforce our borders from those who decide to live here with no visa, no green card, and no documentation. In fact, the government is so huge and imposing that it is giving many Americans the creeps. Can anything or anybody stop it from consuming everything in sight? Nothing could kill the movie Blob creature no matter how all the stars in the movie tried. Only by accident did the teenage heroes in the movie discover that the Blob was afraid of the chilling effect of the CO2 in fire extinguishers. The movie ends with the Blob being frozen stiff first, shrunken, packaged up on ice, flown to the Arctic Circle and then dropped into the tundra with expectations that it would stay dormant for all time. Would it not be nice if we could freeze our big blob government into inaction or at least into submission so that we again could gain control? It is simpler that you can imagine, and the operative word is V-O-T-E. If you are unemployed because of this government, your vote can literally bring back your job. The law offices of Ajay K. Arora, of New York City will tell you that H-1B visas and any other US visas are well achievable for foreign students if they choose to use their law firm. They do not look for American students as clients because foreign workers ultimately work for far less money, whether they are legal or illegal. Corporations just love not having to spend their last dime on employees. They also like the fact that foreigners know if they don’t work extremely hard, their apparently benevolent corporate sponsors will turn them over for deportation as soon as a replacement player arrives. The H-1B visa is just one of many US visas but it is one of the most annoying for Americans who have prepared for their careers with many years of post high school education. It is also very annoying for their parents with whom they continue to be forced to live. The unemployed do have few choices. The total-life plan in today’s big government may have influenced some parents to be initially pleased that aspects of Obamacare help them pay for the healthcare of their overage, unemployed children. Unfortunately, if you ask them straight out, you would find that no parent paid the freight to any University or cosigned the monster Sallie Mae loans so their child could become overage and unemployed, regardless of how inexpensive his or her healthcare insurance may now be. The Arora firm is just one law firm that makes tons of money making it more comfortable for aliens to enter the US as students, and then later citizens. In tough economic times, each successful Arora client means a recent American college graduate will be unemployed until they choose to downgrade their aspirations. Meanwhile the Arora clients from CountryX with visa or green card in hand, get to brag about enjoying the American Dream. There are many law firms such as Arora available to help H-1B visa aspirants (foreign students and foreign workers) to gain their ultimate goal of legal employment in the United States in a professional capacity. Unfortunately, there are no such law firms to help United States students and other citizens who have been discriminated against because of the favoritism our Congress and the monstrous federal bureaucracy give to non-Americans. The H-1B Visa is a nonimmigrant visa. The term nonimmigrant in this context means that the recipient is expected to go home when the visa is completed. But, less than 1/3 of them do go home. Congress created the H-1B visa and its requirement for college educated foreign workers for specialty jobs but then lifted the “temporary” part. Our Congress is tricky like that. Some might call it deceitful and corrupt. Congress thus can tell the people it is temporary since it is a non-immigrant visa but the law means something else. What about other non-immigrant visa types? Other non-immigrant visas such as F and J (used by foreign college students and students enrolled in US training programs) do not allow the holder to apply for permanent resident status. These visas clearly are intended for non-immigrant foreign nationals. Congress created the H-1B visa as non-immigrant visa but as noted previously, the dual intent part is actually un-American. Among other things, dual intent permits the H-1B visa holder to work in the US as an alien, having promised never to try to become a citizen, yet recognizing that if the alien could be a citizen they would hop on the opportunity, and it would be granted to them without much effort. So, with H-1B, the “temporary” legal alien knows they can become a citizen very easily but Americans are duped by Congress into thinking these non-immigrants will do their six years of visa work and exit the country, freeing up an American job. But, they never leave, and Congress knows they never leave. As tough as it may be to swallow for an American engineer collecting unemployment, H-1B holders are permitted to file an immigrant application while still holding a non-immigrant visa. This means they are permitted to apply for a green card for permanent immigrant residence, and it will not affect their non-immigrant status. How can this be? The only reason this visa is typed as “non-immigrant” of course is because the US has elections every two years and Congress wants to be reelected regardless of how they have hurt the American people. In other words, like so many other things, Congress is not the solution here. It is the problem, and this is just another clever lie and another reason why all Americans must vote out even our Senate, and even the whole House if they fail to address this critical jobs issue. Often the applicant who gains the H-1B visa is already in the US on a student visa (F or J visas). The “specialty” occupations include research and development jobs, scientists, lawyers, engineers, actuaries, financial analysts, architects, doctors and nurses, accountants, computer analysts and programmers, web and graphic designers, and even fashion models. Yes, fellow citizens, unless you own the company, these are America’s best jobs. Parents wondering why Johnnie or Susie cannot get a job after graduating from college or graduate school now have a major problem solved. You can thank Congress for the H-1B visa scam. While Americans are still losing their jobs, every H-1B visa holder gets some of the best employment the United States can offer. Please see the article titled, “Too Many Visas for Tough Economic Times,” for an introduction how the government’s generosity in granting visas is affecting American Jobs. There is a certain irony about the heralded provision in Obamacare that permits children up to 26 to be under their parents’ insurance policy. Since the government permits as many as 2 million new legal workers each year in America, and lots of those are for great jobs, that explains why Daisy or Sonny are unemployed. The government created the need for the insurance provision by inhibiting your children from getting worthwhile jobs (taken by foreign nationals). But then the government came to the rescue for adult children with Obama-style health insurance. Obama is really the wise one here because he gave this Obamacare provision so that parents could claim their unemployed overage children on their declarations for health insurance, after first making them unemployed. Of course no parental payment for insurance would be necessary if their smart children were able to get good jobs with benefits. Isn’t that the way it is supposed to work? So, please don’t praise Obamacare for its small percentage of help. Feel free to curse the Obama administration for keeping your children from getting good jobs. And while you are cussing, remember that this administration likes the notion of you, your children, and everybody else’s children being helpless. As a thought, would it not be better to let the foreign students get healthcare on their parent’s policies in their home country? Would it not be better for our children to get the jobs that US corporations willingly give to foreign nationals who will work for less than Americans? You and I know the answer. But, the government blob does not care what we think. There is only one answer – V-O-T-E-! It hurts to repeat but it is easy to miss the significance of what I just communicated. Our government, even in times of recession, encourages millions of foreign nationals each year to come to America to work for lower wages than Americans. Eddy Murphy could not have attracted as many in Coming to America, as Congress has done by making the journey so lucrative for foreign nationals and so painful for Americans looking for an honest wage. American corporations love the notion of the H-1B visa as it is a vehicle for low-cost hi-tech labor. Corporations and other enterprises are very pleased to use the H-1B visa to gain significant payroll savings from two different sources. The first is quite obvious, cheap labor. Analysts call the savings gained as Type I savings. US Employers gain Type I wage savings by paying H-1Bs less than comparable Americans. The second bonanza comes from savings gained by hiring younger foreign nationals instead of older Americans, who command a higher salary. Said just a bit differently, employers gain the Type II wage savings by hiring younger, cheaper, H-1Bs instead of those older (age 35+). Those over 35 are the most expensive Americans so they are ignored by the H-1B headhunters. By any other name, the type II savings are a major source of legal age discrimination. For the just under 40 Americans, who by a few years have been left-out of the bonanza, they get to enjoy the same income sources of a really old fart without having Medicare or Social Security. So, they get to spend their days looking for a buffer that keeps them from the poorhouse. As hard as it is to believe, some of America’s stellar corporations engage in this practice. One of the poster children for hi-tech labor arbitrage is the Intel Corporation, often found in literature written to convince Congress that they done the people wrong on H-1B. Intel is cited by experts on the subject as one of the nation’s worst employers, but the idea is ameliorated by some writers, who suggest Microsoft is just a bad as are many others, even Apple. But, who would give up their iPAD just to make a point about American corporations not acting like they are American? You dont believe me so! The median salary for engineers at Intel is $64,480. This may at first seem like a high salary but it includes all engineers. While junior is looking for a starting salary in that area, dad is included in the average. What chance does junior have at Intel when there are tons of H-1Bs every year willing to work for less. To know whether Intel benefits from unlimited access to legal foreign nationals through the H-1B and other channels, consider that the national median salary range for American workers with the same education as the Intel engineers is $82,333 to $105,500. No wonder Intel is licking its chops when the H-1B shopping cart comes by. Americans in the know dislike this H-1B visa mostly because it eliminates jobs for Americans and it depresses wages for everybody lucky enough to find work. The H-1B Visa is one of the most widely issued temporary visas in the United States. Presently 65,000 H-1B visas are granted officially each year and the holder can stay from six to ten years or more in the country. If your visa expires and you want to extend it, an additional 20,000 is added to the cap for those who really do not want to go home. Academics are not included in the cap so these and other visa opportunities swell the number of H-1Bs to as much as 200,000 or more per year. And, I know first-hand that they replace Americans. If you are counting over six years, that’s as much as 1,000,000 or more very good jobs that Americans cannot get because Congress has given all the opportunity to foreigners and has turned its back on Americans. How about this thought? If we replaced our 535 Representatives and Senators with foreigners, we just might get substantially better legislation. It is worth considering. How about an H1-C visa for Congress and an H1-S visa for Senators? We use the H designation because the House and the Senate would argue that they are professionals just like all the other H visa holders. Why should Americans not have the benefit of the finest minds in the world for our Congress? To literally add insult to industry, there are many law firms such as Arora, and other companies that help the H-1B visa holder, after the person puts in their six or ten years, to transition from non-immigrant status to immigrant status by achieving a green card. In these cases, the jobs they take never become available for Americans. As a point of note, the Center for Comparative Immigration Studies in San Diego says 2/3 of the H-1B visa population transition to permanent residency (green card) each year and the percentage is rising. A green card is an official document issued by the U.S. government to foreign nationals, allowing them to work legally in the United States. 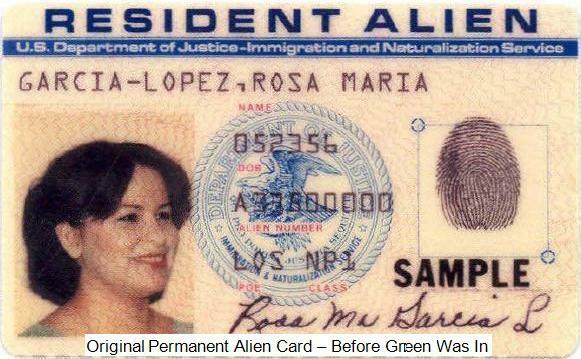 Technically a green card is permanent, but the actual card does expire in 10 years. 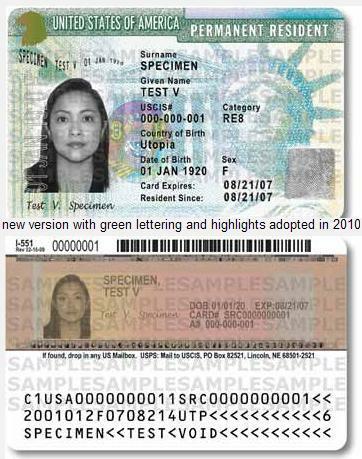 However, green cards (color is green) are renewed routinely with less hassle than it takes a US citizen to get a passport. Well over a million green cards are issued each year, granting foreign workers permanent residence in the United States. One has to ask about the Congress’s wisdom in authorizing a system of granting well over two-million plus almost permanent worker permits / visas per year. They know these take precious American jobs. These jobs will never come back to Americans. With numbers so large, is it no wonder that there is major unemployment in the US in this recession? What would happen if Congress put Americans before foreign nationals? Don’t you think that unemployment would be reduced substantially? Over two million foreign nationals taking American jobs each year during a major recession is very difficult to understand. With two to three million Americans losing their jobs every year, bringing in about 1.2 million foreigners as permanent residents with green cards and another million on visas, makes as much sense as using gasoline on a fire instead of water. How does the Visa Program Work? When a person obtains any kind of work visa from high-tech to low-tech, that person is issued an Employment Authorization Document from the United States Citizenship and Immigration Services (USCIS). This year the number of EADs (includes H-1B visas) is expected to be well over one million. Though that does not necessarily say we have over two million new foreigners coming to work in the United States each year, if it is not two million it is just about two million. Since we are relying on government to do the counting, perhaps it is more like three million? With as many as three million Americans per year losing their jobs in this long-lasting recession, do such huge legal immigration numbers make good sense for American citizens? Who says we need two to three million more foreigners to work in this country? You and I see immediately that this is ridiculous. Our Congress for its own reasons chooses not only to not fix this but legal immigration never even makes the agenda because somebody would call the proponent racist. If simply helping American citizens makes me a racist, then I welcome the label, but it surely would be misapplied. Most citizens do not pay attention to what is happening with legal immigration because there is such a problem with illegal immigration. Americans are getting whacked legally and illegally. On top of the several million legal foreigners per year taking America’s better jobs, don’t forget the 20 to 50 million illegal foreign nationals that are very obviously on our streets, shopping centers, stores, and of course, our workplaces. The only place illegal foreign nationals apparently do not exist is in our universities. And, that is precisely why American Corporations and American Universities, and believe it or not, even the National Science Foundation (NSF), lobby Congress incessantly to permit more legal aliens to study and work in America using student visas and work visas such as H-1B. Here is a personal story about me but I assure you I use it only for dramatization purposes and it will not be long. I have been teaching in colleges and universities since I was a kid in my twenties, for well over thirty years. I am now in my sixties, and I am about to receive my last paycheck from the last University for which I worked as a “full-time” professor. I sure know how important the foreign student has always been for colleges to meet revenue objectives for their businesses. “Yes,” colleges and universities are businesses at the dirty rotten bottom of it all, and “no,” in my opinion, the plight of Americans is not even close to being one of their concerns. However, colleges and universities do care about whatever can bring them success. Revenue is the deciding factor for success in all businesses. As businesses, colleges and universities would not object if 100% of their students and faculty were foreign born, and they would not object if they were able to place them all, every last one of them, in an American business upon graduation. It is not their mission to care whether American applicants are denied opportunities for education or jobs when they graduate. Like all businesses, business comes first for the educators of our older children. Foreign students and foreign faculty are very good for the business of American Universities. Consequently, college age Americans are caught in a box. They have little opportunity for either entry level or high tech positions with or without a degree. Entry level positions are taken by illegal foreign nationals, and high tech positions are taken by legal foreign nationals. Corporations and other enterprises, such as universities find a much more lucrative source of cheaper labor in the underground market. Congress helps all businesses ignore the employment needs of Americans with millions of visas and green cards each year, offering outright favoritism for foreign nationals. Congress has stacked the deck against all young Americans-- your children and mine. In recent years we know that entry level (starter) jobs for recent high school graduates are taken mostly by illegal foreign nationals. Congress and the president choose not to close the borders. Moreover, if a young American chooses to continue on from high school to college and graduate school, when they are ready to capitalize on their investment by seeking employment in the high-tech industries, the jobs are already taken by legal foreign nationals on visas or they are taken by permanent aliens. Yes, it is sickening, but only if you are an American. Again, thanks to Congress, the winners in the jobs lottery are foreign students, many of whom graduate from American universities while on student visas. While Americans are saddled being Americans, the foreign (F and J-visa) student has no such constraint. From their first day of class, these students work for their degrees as well as the H-1B and other worker visa prizes they hope to gain when they graduate. Green cards are distant but are viewed as readily attainable with the right corporate help. American students don’t know what has hit them, and they are caught off-guard, wondering why they are unemployed years after receiving their college or graduate school degrees. So, they often sit around the house for a few years until they realize it is not getting better. Since they have never held jobs, they are not even included in the unemployment numbers. Some may choose to go back to school in another major area of study or they accept lower employment if they can get it. Most of these young Americans don’t blame Congress because they can’t believe that any American leader would do this to them. Yet, as sure as they are unemployed in masses, it was Congress that gave their jobs to foreign workers willing to work for lower wages. From where I sit, Congress should pay the price. After getting a work visa, foreign student graduates and others know they do not plan to go home. So, as soon as they can, they go for a green card, which means “permanent worker status.” When they get the green card, their next big prize is US citizenship. The green card gives them an eternal waiting period to gain a citizenship slot. Meanwhile, back at the ranch, Americans continue to be unemployed because these fine people from foreign lands, whose only issue in life is that they are not American, have taken their jobs. Despite the plight of the American worker, some of the most obvious supporters of Americans have checked this out. Their perspective is surprising. Americans as a whole are already doing too well. United States unions, the US national government, including the NSF, as well as the Congress and the President like that trek to downtrodden from the educationally prepared. As hard as it is to believe their perspective is that it is OK if Americans are left behind now because for years things have been so good for Americans, people from other countries have suffered. They like seeing more and more foreign labor and they call it diversity and they say it is good. They like seeing less-capable foreign people sitting in high-capability seats so that the “normal Americans, who graduated from the universities with job expectations, don’t get those jobs. As a Democrat, I find it reprehensible that our government chooses non-Americans to rule supreme and in so doing punishes Americans just for being American. I am for Americans first as all American citizens should be. This is our country. So, I would like to see more Americans employed and when that does not happen, I call it unemployment, and our government is the perpetrator, but it has a lot of help. US colleges and universities fill more than half of their graduate student seats with foreign nationals. These foreign students are in those seats so they can get a prestigious degree from an American University. From there, they expect great employment, and then they look forward to permanent residence status while hoping to become citizens. You can’t blame them for going for the gold ring but you can blame Congress for taking all the gold rings away from American students. Why has Congress given American rights and opportunities to foreign nationals? Maybe they forgot they are to represent Americans? The stated reason for the government being so kind to foreign nationals is that the students get the opportunity to study in the United States so that they will be better able to contribute to the development of their home countries when they return. That may be the original intention of the program; but the program has gone astray and is hurting Americans every day. Foreign students, for example, have their own skin to worry about and just like those of us wearing our skin, their skin is most important to them. Most have no intention of ever going back home, but for a quick visit. So, a good portion of all foreign students who choose the US over other educational alternatives across the globe, seek to remain in America. In this way, their personal lives and opportunities are enhanced. Always looking to get new employees for substantially less salaries, opportunistic U.S. employers see these students as a pool of cheap recruits for jobs. Americans need not apply. Congress has seen to that. There is also a little game going on to attract foreign students, but not many universities talk about it freely. The professor game is set up to hire foreign national Ph.D. level professors, who are often not yet thirty years old. These new “profs,” are newly minted and often come from American Universities with high academic credentials. They are the ideal workers in Universities since they will work for less than Americans, almost as indentured servants so they do not get deported while they seek a green card. This works well because it costs the University less salary and the foreign students feel comfortable having a non-American in front of the classroom. So, who permits these injustices to occur to American students and American employees? The one word answer is “Congress,” but, the President is not complaining about it. Do Americans make poor engineers? With US graduate universities pumping out more and more foreign students as graduates, who, along with other H-1B holders, then take a disproportionate share of the best high-tech American jobs, American students have begun to choose other majors and career opportunities. It is not that Americans make poor engineers and scientists. In fact, Americans would make phenomenal engineers and phenomenal computer scientists. However, they are either denied a seat in the class or they choose not to enter the engineering or computer science fields because there is no assured payback for all the hard work. It is no secret that the foreign student graduates have turned formerly prestigious hi-tech jobs into low-paying professions. Thus, the best and the brightest American students choose other areas because they won’t be able to make a buck when they graduate. Foreigners take the jobs because they work for less, and there are plenty of them. With the approval of Congress, the Universities and the corporations have discriminated against American students. Yet, American billionaires such as Bill Gates think American students are wanting in terms of what they can contribute. Gates thinks foreigners are smarter. He knows they come a lot cheaper so maybe that influences his thinking. Now, Bill Gates does have many honorable degrees because he is rich, but, from my recollection he was a Harvard dropout so how his opinion of whether Americans college students are smart is suspect. Gates has no real degree of his own, because he either did not have it, was too busy, or could not get the guts to finish college. Despite that, he thinks Americans should get out of the way and let foreigners take the better jobs because they, not Americans, are the best America can find. I think it is time Gates found another country in the Pacific in which to live. For a high tech mogul; how about Mars, Mr. Gates? This essay is for Americans since I am an American and it is written for Americans. Can you believe a guy like Gates who could not finish college believes that American college graduates are inferior, even though he never graduated with one of them. Gates believes that Americans cannot do well in the International marketplace. People like Bill Gates tell their companies to downgrade the pay that American engineers receive in America, and then, because America is not a country in which indentured servitude works well, guys like Gates complain there are no good American born engineers. He means there are no good American born engineers who will work cheap. Unfortunately for America, selfish corporate leaders such as Bill Gates are not good Americans, and their companies are not very good at being good for America. Organizations like Microsoft and Intel, and others who want cheap legal foreign labor, argue that Americans simply are not good enough. They say that American Universities are not putting out the best “product.” Why is it then that they like the foreign-born graduates of these same American Universities? It is the American-born they do not appreciate, because Americans want a real day’s wage for their daily work. This self serving affront on American college graduates and other workers then gives Gates and others the apparent rationale they need to lobby Congress to demand the right to bring in more foreign born “product.” It takes a lot of chutzpah to say there is a “shortage of excellent workers,” when any shortage is created by the low wages American corporations now choose to pay. Americans are the best in the world when directed properly and when treated fairly. Corporations never mention that they pay less because foreigners are helpless when seeking a green card and they will work for peanuts. Even if their arguments were less valid, recent decisions show that Congress would continue to accede to their demands as they always do, even though such action shortchanges good Americans. Why Congress chooses to reward corporations for bad behavior that should be labeled as anti-American should be an election issue in every precinct of every county in every state. Does Congress really understand who is supposed to run the country? The real corporate hiring game is to recruit a cheaper foreign product though we all know that nobody is better than an American employee. The Universities produce a cheaper foreign product and they hire cheaper foreign products as their new professors, regardless of whether the professors have any practical expertise in the field. As an IBM Hi-Tech Expert, and a long time professor, I can tell you first hand that the colleges and universities will fire existing competent professors to gain access to new, less expensive foreign professors, who sometimes cannot even read the textbook to students and have his words understood. Moreover, colleges and universities will choose not to hire high quality American Professors when they can get foreign professors for ½ price. They save lots of dollars while telling their alumnae and donors that it is all about diversity. The Democrats do not complain though even their children are affected negatively. It would upset their Marxist/Leninist cronies in the school administrations and the faculties of the universities. Since for a rebuked politician, academe may be their next job, they would choose to let their kids take the hit, so they can find their next place of employment. The Republicans are not the godsends here. They are easier to figure out, however. They simply want the cheapest labor for their businesses. So, with Congress, both D and R taking the side of corporations and universities, one might ask “who speaks for the American parents and the American-born students, and the American employees who are cast aside?” Unfortunately, the answer is “nobody.” That is probably why you are reading this essay. We must fire them all. Ironically, because of the propensity to hire foreigners on visa for less money than American graduates, parents find their precious adult children living at home longer – often into their thirties -- before they get their first job. All Americans need to give Congress a clear message that lip service is not acceptable anymore when the breakage is our children. Congress must change the immigration rules so that the children of Americans get preferential hiring over cheap-working foreigners. Most Americans do not want to understand the various notions of visa entry for foreigners. Most Americans, until recently have thought Congress was working for Americans, and not other entities. Congress listens to organizations with an axe to grind instead of the American people. For example, for years the National Science Foundation (NSF), a US government agency, has been jealous of the lifestyle of University professors with tenure. The NSF scholars see four months off in the summer, and high salaries for University professors while they work 12 months. To get back at these “peers,” the NSF has lobbied Congress to increase the number of foreign born professors to help bring down the salaries of long-time professors. The easiest way to achieve this is to make it easier to bring in foreigners. The suggestion is that the foreigners, a.k.a., international (non-American) professionals, are the cream of the crop, yet there is no empirical evidence to prove this. Without evidence, we can conclude that it is not a matter of better professors; it is a matter of professors who will work “on the cheap.” If the foreigners were truly at the top of their game, for the value of their work, they would command a higher, not a lower salary. Thus, one can conclude that the system is broken. Congress is inept, yet it is still the facilitator of the deception. It is loaded with buffoons who care little about the public they pledge to serve. It is time the NSF and all such anti-American-born employee organizations is disbanded and defunded, for the good of all Americans. One thing our Congress knows is that there are those things that the people will not like no matter what. So, they hide the truth and they are good at lying. For example, Congress intrinsically knows that foreign labor of any kind, especially in a recession, is unpopular with most Americans. Yet, flirting with the wrath of the voters, Congress still plays favorites. They place foreigners at the top of their lists, but all is done under the stealth light of non-detection. They think Americans won’t notice what they are doing to Americans. Americans notice for sure but until they read informational pieces such as this, they might not believe that Congress is the real perpetrator. Professor Norman Matloff, an expert in visas and government abuse of the visa programs, has written extensively that Congress has quietly slipped major changes into laws to help foreign nationals and to hurt Americans. Matloff has noted that the legislation in bills is often masked so that it looks like it is about illegal immigration. It is subterfuge. I share Dr. Matloff’s opinion that most citizens believe that Congress is working for Americans first. Unfortunately, this is not the case. You cannot have a well-poured drink in Washington DC without running into a lobbyist bragging about how they did this or did that to achieve their sordid goals. Lobbyists for foreigners know that the topic of Americans losing jobs to foreigners is so controversial that when they write legislation for Congress, they frame it so that the provisions that favor foreign labor can slip through unnoticed. Don’t think for a minute, despite their flowery rhetoric that Congress is not against the American side of this issue? They want nothing that is American. Congress can change this all tomorrow if they chose to do so. Since they have yet to do this it is appropriate that the whole Congress should be fired. American students often are deemed ineligible for the prestigious graduate school appointments because of the foreign student acceptance rate. This must surely enrage American mothers and fathers who want the best for their American-born children. Americans often get denied at the school gate but perhaps even worse is that those who do get accepted and graduate, are denied in the employment line. Permitting such a large number of H-1B (hi-tech) work visas or adding to the number by unlimited extensions or through massive green card acceptances makes it a really dumb decision for a US student to choose to be a hard science major. If we want Americans to engage in the hard sciences for the good of the country and for the ultimate defense of the country, then we must stop giving the bulk of the opportunities to foreigners, some of whom actually hate America and Americans. Parents know that somebody other than Americans is getting the engineering and science jobs so they wisely advise their children against making a wrong career decision. This must change and the way to change it is to have an America First policy. With the once prestigious National Science Foundation rooting for foreigners over Americans, what more proof do we need that big blob government has forgotten about Americans? If you fully study the literature about H-1B visas and American policy towards foreign graduates from American Universities and foreign graduates from other country’s universities, you will find that the ones left suffering are Americans. The most suffering are the new college graduates and those Americans over thirty-five. Have you heard Congress talking about a solution recently? Nor have I! As hard as it may be to believe, it was our government’s active policy to swell the labor market with foreign nationals in order to hold down wage levels. This has enabled businesses and even universities to cast aside Americans for cheaper-working foreign nationals. It has also permitted systematic age discrimination. As for the NSF and other American institutions being the villains, there is more truth than jest. The fact is that the NSF lobbied Congress intensely to create the H-1B program, and they continue to push for more. They want the floodgates open in a global society, for the US to admit more and more foreigners. They pay no attention that the number today is already about 2 million per year. They are globalists and by definition are not pro-American. Congress, for its own reasons, is not our friend. With the NSF and corporations, Congress dutifully complies, and the existence of the H-1B and the loosening of the criteria continue to punish Americans whose only fault in life is that they were born here. The bottom line of course is that our Congress has made a number of big mistakes but, upon reflection, permitting foreigners to take American jobs was not a mistake. It was intentional. This Congress has no right to represent Americans! Vote them all out and waste no time doing it!